A confirmation letter for an employee is a document handed over to an employee informing him/her that he/she is now a confirmed employee of the organization. This letter indicates that he/she is now a confirmed employee. It works as a proof of employment, which is often necessary, especially when a person applies for a bank account, insurance, or a new job. This is also an essential document for a company to know if that person is willing to work for them or not. A confirmation letter for an employee is about giving all details about the job criteria to a newly appointed employee. A sample is given to assist you. This letter will serve as a confirmation to your job. I hope that you will be happy about this confirmation. We hope to have you as an asset to our company. We look forward to obtain great work and productivity form you. You need to submit all the required documents in our company and I would request you to fill the admission form at the reception as soon as you join the office. Please plan to begin work on 10th June. I will contact you within a few days to confirm your joining date. Given Below are a few confirmation letter samples for a clearer Idea. Employees go through an interview process to get selected in an organization. 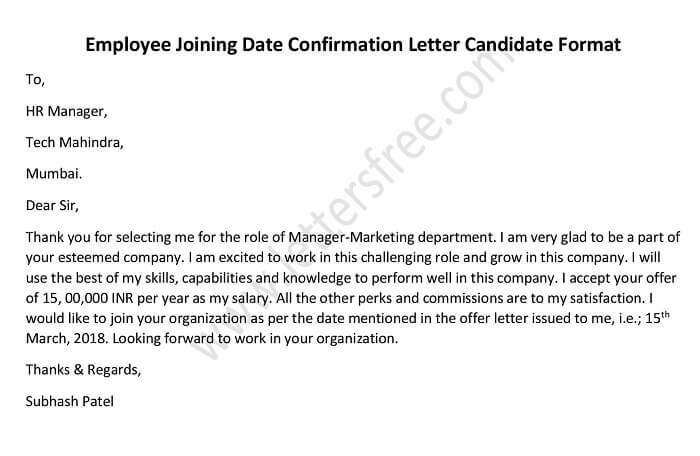 The candidate received a job confirmation letter from employer mentioning all the details and joining date in that confirmation letter. A confirmation letter is issued by the management in response to the leave application submitted by the candidate. This letter confirms or grants the leave to the candidate. The confirmation letter for an interview is written to confirm the scheduled for an interview of the candidate with the organization. A Letter of credit is basically issued from one financial institution or any institution of the same kind to a person to make a confirmation in respect of his/her credit application. The religious confirmation letter is basically written in Roman Catholic places. This letter is the way through which person receives the permission to undergo the confirmation procedure for a Catholic sacrament. A Salary verification letter confirms that an employee works for the company with his/her current salary. An employer typically creates a Salary Verification Letter.